Every individual involved in the process of planning, designing, financing, constructing and operating physical facilities related to the project under consideration, gain different viewpoints on project management for construction. The contribution of proficient knowledge can be very beneficial, mainly when it comes to large and complicated projects, since experts in various specialties can offer valuable services. On the other hand, it is very important and advantageous to understand how the different parts of the process match together. The poor coordination and communication between the specialists can result in waste, excessive cost, and delays. It is chiefly the requirement of the owner to assure that such flaws do not happen between them. And it owes all participants involved in the project to regard the interests of owners, as at the end, it is the owners who provide the resources and make the decisions. Implementation of owner’s viewpoint will help the participants to focus on the completion of the project by having proper attention in the process of project management for constructed facilities. This would minimize the old concept of bringing decisions based on the historical roles of specialists involved in the project. Specialists mentioned are the planners, architects, engineering designers, constructors, fabricators, material suppliers, financial analysts and others. It is true that each specialist individually has a lot of contribution to the advances seen in the construction field. But the understanding of the entire process of project management will make them respond more effectively to the owner’s desires. Hence, they can contribute their proficiency through opinions in improving the productivity and quality of their work. Enhancement of project management boosts the construction industry which in turn facilitates the development of national and world economy. To have significant improvements, know the construction industry, its working environment and the institutional constraints affecting its activities and the nature of project management. The purchase of a constructed facility is a major capital investment. The owner can be an individual, a private corporation or a public agency. As the commitment of resources for such a large investment is stimulated by market demands or real needs, the facility is likely to satisfy certain objectives. These requirements will be within the constraints of the specified owner and applicable policies. Most of the constructed facilities are custom made in consultation with the owners, with an exception in the case of the residential units that may be sold as built by the real estate developer. He is regarded as the sponsor of building projects, so far as government agency may be the sponsor of a public project and turns it over to another government unit upon its completion. For project management, the terms “owner” and “sponsor” are one and the same because both have the ultimate power to make all important decisions. It is judicious for any owner to have a clear understanding of the acquisition process to sustain firm control of the quality, timeliness, and cost of the completed facility, as he is essentially acquiring a facility on a promise in some form of agreement. 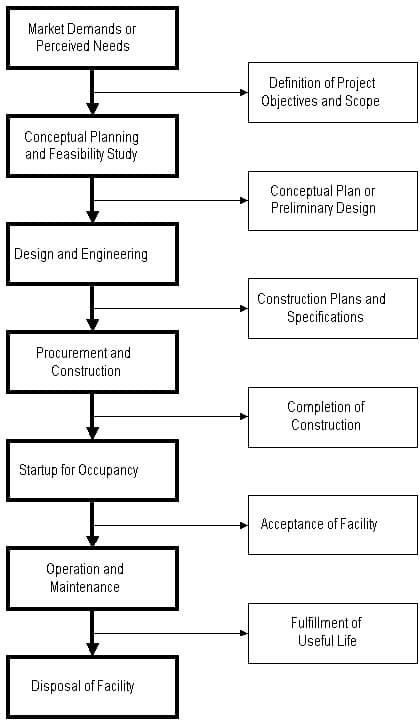 The project life cycle for a constructed facility may be represented schematically in Figure 1. A project meets the market demands or requirement on a timely basis. a variety of possibilities may be taken into consideration in the conceptual planning stage. Hence the technological, as well as the economic feasibility of each option, will be assessed and compared to select the best possible project. The financing strategies for the proposed options and ideas should undergo a clear examination, which is later programmed with respect to the timing for project completion and based on the cash flow availability. Once the scope of the project is clearly explained and defined, thorough engineering design will provide the blueprint for construction, and the definitive cost estimate will provide the baseline for cost control. Careful planning and control during the procurement and construction stage, the delivery of materials and the erection of the project on the site has to be maintained. Once the construction is completed, there is usually a brief period of start-up of the constructed facility when it is first occupied. At last, the management of the facility is turned over to the owner for full occupancy until the facility lives out its useful life. That is to check the building durability once the functionality is started. If the building cannot show any defects before the period specified, it was chosen for demolition or conversion. The stages of development may not be strictly sequential as shown in figure-1. Certain specific stages require iteration, and the others can be carried out in parallel or in overlapping time frames. This decision mainly depends on the nature, size and urgency of the project. Moreover, an owner may gain house capacities to handle the work in every stage of the entire process. If it is not possible they may request professional advice and services to guide the work in all stages. Reasonably, most owners choose to handle some of the work in-house. To guide other components of the work, they give the contract to outside professional services as per requirement. Analysis of the project life cycle from an owner’s perspective would help us to focus on the proper roles of various activities and participants in all stages apart from the contractual engagements for different types of work. A brief description specifically about each stage are explained below. We have to create and evaluate the project in order to determine if it is feasible and if it should be undertaken, at the beginning of the project. Here the project objective or need is identified; this can be a business problem or opportunity. A suitable response to the need is documented in a business case with recommended solution options. A feasibility study is conducted to examine whether each option clearly identifies the project objective and a final recommended solution is determined. Many questions related to the issues of feasibility i.e. “can we do the project?” and justification like “should we do the project?” are mentioned and faced. When a solution is approved, a project is initiated to implement the approved solution. For this, a project manager is appointed. At this stage, the major deliverables and the participating work groups are identified. This is the time when the project team begins to take shape. Approval is then required by the project manager to move onto the detailed planning phase. The planning phase involves further development of the project in detail to meet the project’s objective. The team identifies all of the work to be done. The project’s tasks and resource requirements are identified, along with the strategy for producing them. In a broader sense identification of each activity as well as their resource allocation is also carried out. A project plan outlining the activities, tasks, dependencies, and timeframes is created. The budget of the project already estimated is used to monitor and control cost expenditures during project implementation. Finally, we require a document to show the quality plan, providing quality targets, assurance, and control measures, along with an acceptance plan, listing the criteria to be met to gain customer acceptance. At this point, the project would have been planned in detail and is ready to be executed. This is the implementation phase, where the project plan is put into motion and the work of the project is performed practically on site. It is essential to maintain control and communicate as needed during each implementation stages. Progress should be continuously monitored and appropriate adjustments are made and recorded as variances from the original plan. A project manager is the one who spends most of the time in this step. Throughout the project implementation, people carry out the tasks, and progress information is being reported through regular project team meetings. The project manager uses this information to preserve control over the direction of the project by comparing the progress reports with the project plan to measure the performance of the project activities. If any deviation is found from the already defined plan corrective measures are made. The first option of action should always be to bring the project back to the original plan. If that cannot happen, the team should record variations from the original plan and record and publish modifications to the plan. all through this step, project sponsors, and other key stakeholders are kept informed about the project’s status as per the agreed rate and format of communication. The plan should be updated and available on a regular basis. Status reports should always highlight the probable end point in terms of cost, schedule, and quality of deliverables. Each project deliverable produced should be reviewed for quality and measured against the acceptance criteria. When deliverables have been produced and the customer has agreed on the final solution, the project is said to be ready for closure. This stage is all related to the measurement of progress and performance to make sure that items are tracking with the project management scheduling. This phase regularly happens at the same time as the execution phase. Communicate the closure of the project to all stakeholders. Last and final is to conduct lessons-learned studies to examine what went well and what didn’t. This type of analysis would make the knowledge of experience to be transferred back to the project organization, which will help future project teams.